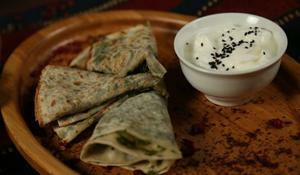 Tasting Azerbaijan’s food is one of the ways of consuming the country's ancient history. A slurp of Dushbara or a bite of Dolma is the best way reflecting the life of ancient Azerbaijani people and their rich cuisine. One of such dishes, Qutab, is definitely among the most popular representatives of the country’s cuisine having an abundance of diverse national meals. Qutab is another masterpiece of Azerbaijan cuisine, which you must taste while you are here. No one can speak about this mouth watering dish without a desire to eat some herb or meat qutabs.